This error is self-explanatory as it tells you that the database user you are trying to drop is the database schema owner. To successfully drop the database user, you must find all the schemas that are owned by the database user, and then transfer their ownership to another user. Here is the Transact-SQL script, which I wrote a while ago, to drop the database user. This script first transfer’s ownership of all database schemas associated with particular database user to the specified database user, and then drops that database user from the database. -- Ensure a USE database_name statement has been executed first. One of the key tasks of a DBA is to maintain the database indexes and make sure they are not fragmented. You can use a sys.dm_db_index_physical_stats in a script to rebuild or reorganize indexes based on fragmentation. However, sometimes we may need to rebuild all indexes on all tables in the database, especially if you have to change any index property such as fill factor, compression, etc. For this task, I wrote a following script that accepts parameters to change the properties of the indexes, and dynamically generate and execute ALTER INDEX statements. This script is compatible with SQL Server 2005 and above versions. --												must be an integer value from 1 to 100 The default is 0. --												For more information, see http://technet.microsoft.com/en-us/library/ms177459.aspx. --												inputs for this parameter are ON or OFF. The default is OFF. --												For more information, see http://technet.microsoft.com/en-us/library/ms188783.aspx. --												parameter are ON or OFF. The default is OFF. --												For more information, see http://technet.microsoft.com/en-us/library/ms188281.aspx. --												modification during the index operation. The valid inputs for this parameter are ON or OFF. --												The default is OFF. --														SQL Server 2005 and above. --												For more information, see http://technet.microsoft.com/en-us/library/ms191261.aspx. --													> NONE - Index or specified partitions are not compressed. --													> ROW  - Index or specified partitions are compressed by using row compression. --													> PAGE - Index or specified partitions are compressed by using page compression. --												The default is NONE. --												For more information about compression, see http://technet.microsoft.com/en-us/library/cc280449.aspx. --												number of processors available to SQL Server. --												For more information, see http://technet.microsoft.com/en-us/library/ms189094.aspx. Today, one of the developers come to me and asked me the question that is there any T-SQL function that he could use to remove everything before and after a specific character in string. 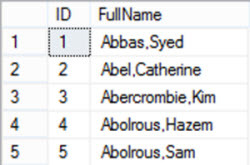 For example, if the table contains the full names of the people in the format as firstname comma surname (Farooq,Basit). He would like to retrieve the first and surnames of people in separate columns of result set. The easiest solution that comes to my mind for this problem is to use LEFT and REPLACE string function combined CHARINDEX and LEN string function. 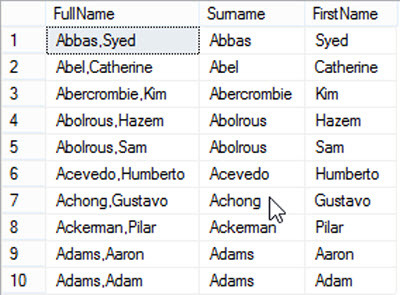 schema_name – name of the partitioned table schema. table_name – name of the partitioned table. index_name – name of the partitioned index. index_type – type of the partitioned index. partition_scheme – name of the partition scheme. partition_function – name of the partition function. partition_number – indicate the partition number. current_partition_range_boundary_value – partition actual boundary value. partition_rows – indicates approximate number of rows in current partition. data_compression_desc – Indicates the state of compression for each partition. This example query uses following system views: sys.tables, sys.partitions, sys.indexes, sys.partition_schemes, sys.partition_functions and sys.partition_range_values. For more information on table partitioning, see “Partitioned Tables and Indexes” on MSDN website. We have about 200 user databases in which we have the full-text search enabled and these databases contain several tables. As part of my daily checks, I have to check the status of all full-text catalogs, to ensure that all full-text catalogs are successfully populated without errors. However, to check the status of every full-text catalog using SQL Server Management Studio is a challenge and very time consuming task. So, to make my life easier, I wrote the following T-SQL script that quickly returns the status of all full-text catalogs and their population status. start_time – Returns the time that the population started. Hope you will find this post useful 😉 . The code of this script is tested on SQL Server 2005 and above versions. Hope you will this post useful 😉 .